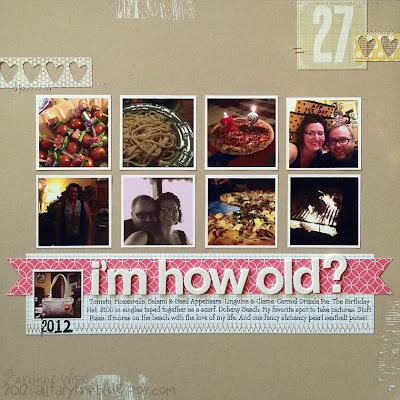 My Wise Designs: A Birthday & A Christmas Layout! 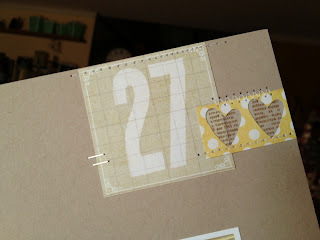 I made this layout for the October 20/20 Challenge and the October Scraplift your Favorites Challenge on Scrapbook.com. 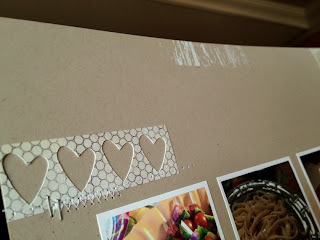 I lifted HappyGRL's "Yummy!" layout. I used Echo Park's Everyday Eclectic (the same as the owls wings in my previous post) and I used Pink Paislee's Cozy Sweater for my journaling. The Thickers are Subway. Great, now I want a Cold Cut Combo. =] I always want a Cold Cut Combo though, lol. LOVE Subway! 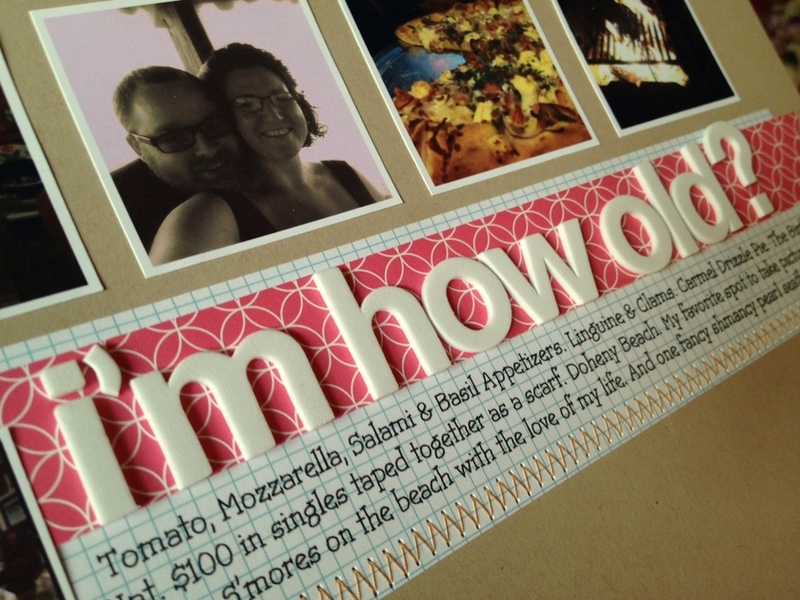 Journaling: Tomato, Mozzarella, Salami & Basil Appetizers. Linguine & Clams. Carmel Drizzle Pie. The Birthday Hat. $100 in singles taped together as a scarf. Doheny Beach. My favorite spot to take pictures. Stuft Pizza. S'mores on the beach with the love of my life. And one fancy shmancy pearl seat belt purse. I used My Mind's Eye's "The Sweetest Thing" for the number.. it's pink chevron on one side (the paper I used for my owl in my last post) and block numbers on the other. 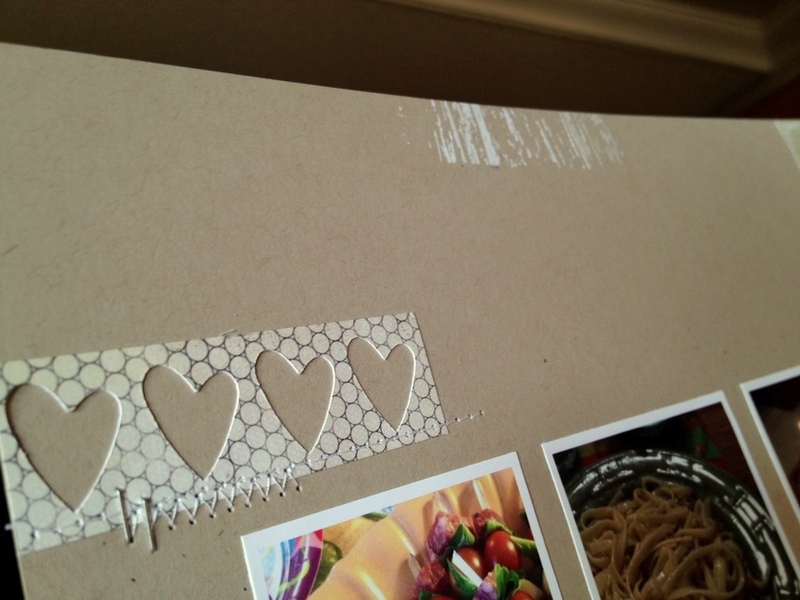 I used some washi tape and some die cut negatives for the hearts. I then added some stitching and used my tiny attacher! I also added some white wood grain rub ons around the edges from EK Success. This layout is also for the October 20/20 Challenge and for the Scraplift the person in front of you Challenge on Scrapbook.com. I lifted Lpeep's "Love" layout. 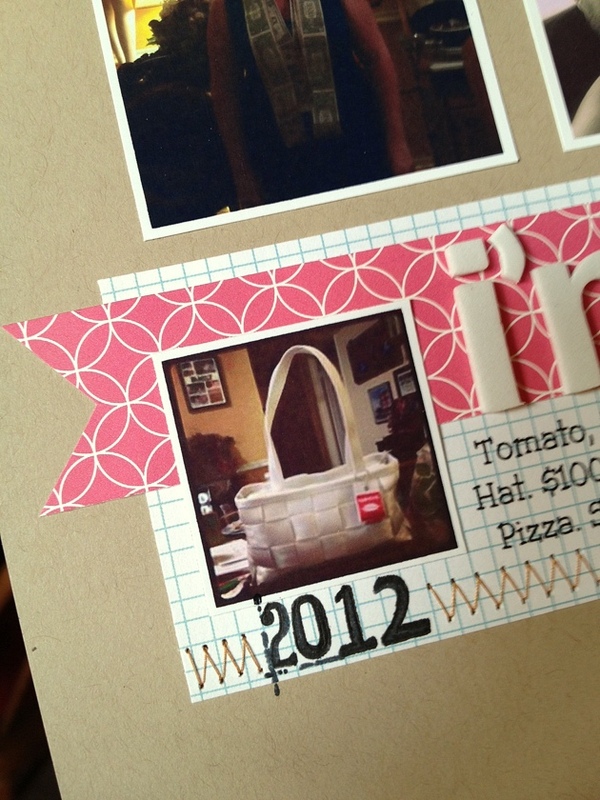 I think this may be the first layout I've ever made with more than one paper from the same collection. I never seem to do that. Probably cause I don't buy collections as a whole, I just buy the papers I like. For the title I used Thicker's "Giggles". I couldn't decide between "Lights Out" or "Out like a Light". So, I put the layout on Instagram and asked for opinions! Journaling: TT took you to go see Christmas lights one night. We stopped by the "music house" where the lights play along with the music. We thought it was off how the music that was playing wasn't even Christmas themed. We watched for about 10 minutes and you were awfully quiet. I thought you were just enjoying the show and when I looked in the backseat, you were sound asleep! When you stay awake, you love looking at Christmas Lights! I used October Afternoon's Mini Marketplace Alphabet Stickers for her name and made a little banner out of the Cozy Sweater paper. I want to say this Label is from Doodlebug Designs.. but I'm not positive. I printed the date on it. 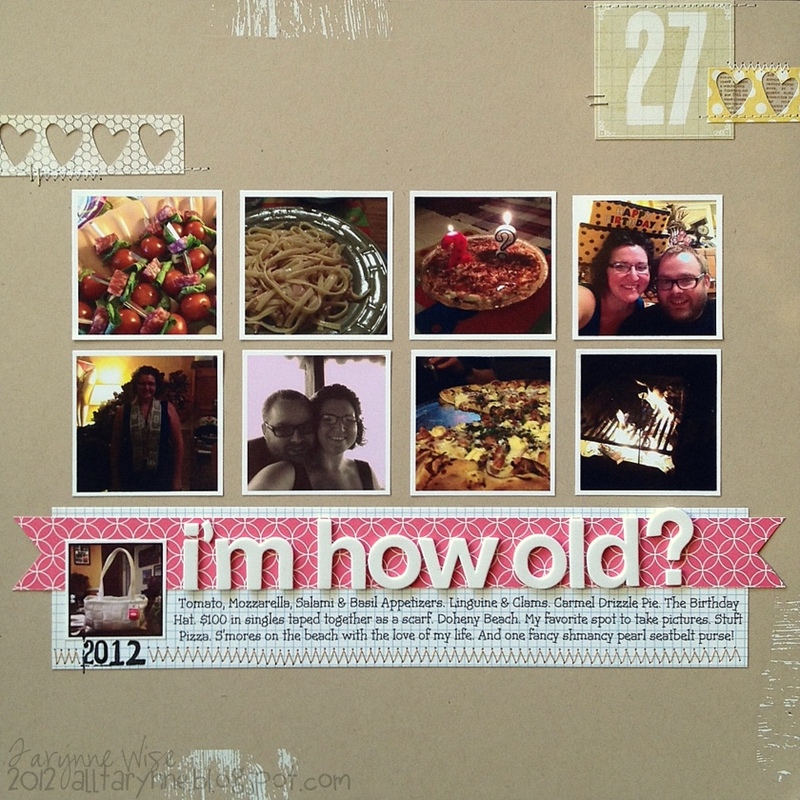 Love the birthday layout, wish I could go back 10 years!